If you were to ask, “Have you tried this Spanish Pinot Noir?” Most people would probably puff up their chests and answer, “Oh, I’m sure you mean Tempranillo, no?” as the concept of Pinot coming from anywhere in Spain is seen as impossible. It’s probably the reason that articles pop up every so often exclaiming as much. But, there is indeed Pinot Noir grown in Spain. If you looked at the grape’s Wikipedia page you would hardly know it though. It is true that it’s still a rather rare grape because as this article points out, the typical Spanish climate will wantonly thrash and disfigure any attempts to produce it. Thus, it’s better grown at higher, less beach-tastic altitudes, such as near a ski slope… Of course, it doesn’t help that many of the DO regulatory bodies don’t allow it to be used and often, the wines get tossed in to the “kitchen sink” of DO Catalunya (if it’s a Catalan Pinot). 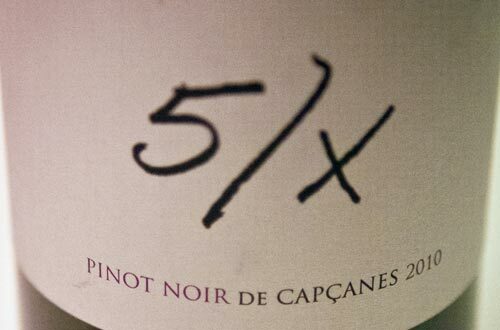 Such was the case for this “5/X” bottle we tasted recently from Celler Capçanes located in the DO Montsant region of greater Priorat, which has to be released as a DO Catalunya wine. But, no matter what DO stamp it carries, this bottle goes to show that at least in Capçanes, Catalonia, if you know what you’re doing like their enolog Àngel Teixidó does, you can produce a fantastic bottle of Pinot Noir.